a learning games section for new football players and fans. 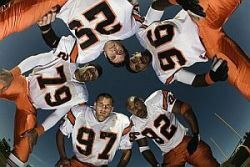 Football games glossary is dedicated to passionate game players and fans that compete, watch this favorite of sport games. Football, also known as American Football, is a sport played between two teams with 11 players on the field per team. The object of the game is to move the football down the field towards and within the opposing team's designated goal posts to score points. The team scoring the most points is declared the winner at the end of four 15-minute quarters. This glossary refers to the terms offense and defense frequently. Below are these terms defined briefly to allow for better understanding of this games glossary. Offense: The football team trying to score. Defense: The football team trying to stop any scoring. Artificial Turf/Astroturf: slightly padded surface covered in a synthetic type of grass that resembles carpet typically used in places known for particularly harsh weather or indoor stadiums. Assistant Coach: coach in charge of a specific part of the team according to the game plan set forth by the head coach. Audible: play called by the quarterback changing the play from the one called in the huddle. Back: term for someone who plays in the backfield. Backfield: the portion of the field behind the line of scrimmage. Ball Carrier: the player who advances the ball by running. Beat: occurs when a player maneuvers past an opposing blocker/tackler. Smooth move! Birdcage: football games glossary term for full facemask, typically worn by linemen. A must-have piece of equipment for this contact sport. Blackout: occurs when a game is set to be televised in the teams' market but not enough tickets have been sold, therefore the game is unavailable locally. Blind Side: the left side of a right-handed quarterback or vice-versa for right side where the blitz or a tackler cannot be seen. Blitz: football jargon for the defense rushing more players to reach the quarterback successfully before he can pass, thereby resulting in a sack. Block: obstructing the way of a defensive player, tactic used by an offensive player. Bomb: football lingo for a long pass. If completed, 'tis a beautiful sight to see! Bootleg: the play where the quarterback fakes the handoff right and rolls left. Bump and Run: the act of a defensive player hitting the receiver at the line of scrimmage to obstruct the receiver's route. May result in shaking the quarterback's timing. Buttonhook: route run by a receiver in which they run straight down the field and abruptly turn back toward the quarterback. Call a Play: football term for executing a pre-planned play. Center: the player in the middle of the offensive line who is responsible for hiking the ball to the quarterback. Chain Gang: the officials responsible for moving the first down and line of scrimmage markers on the sidelines. Check Off: another term for an audible. Chop Block: blocking another player by hitting him or her below the knees. This is an especially dangerous block that is illegal and many times leads to injury. Clipping: blocking an opponent from behind. Clothesline: football jargon for a tackle where a defender hits an opponent high on the body in order to bring them down. Do I hear an Ouch! Coffin Corner: football games glossary term for the corners of the football field between the end zone and 5-yard line at each end of the field. A punter will attempt to aim the ball out of bounds near a coffin corner to stop the opposing team from returning the ball that in turn will pin the punter's team near their goal line. Coin Toss: teams meet in the middle of the field prior to the start of the game to determine who receives the ball to start the game. Completion: a successful pass that is caught by a receiver. Controlling the Game: strategy for using available plays/players based on the time clock. Cornerback: a defensive player who primarily guards wide receivers. Cover: the act of guarding an offensive player trying to receive a pass. Coverage: different defensive formations meant to stop a passing play. Curl: football jargon for a route run by receivers that eventually turns back to the quarterback in an arc. Cutback: a switching of directions. Dead Ball: a ball is considered dead when it is no longer playable. Defensive Back: another term for cornerback. Defensive End: the player on either end of the defensive line. Defensive Holding: occurs when a defender physically holds an offensive player, normally by grabbing the player's jersey. Defensive Line: three or players lined up at the line of scrimmage on the defensive side. Defensive Tackle: the one or two players inside the four-man defensive line. Their duties are to stop the run and assist others to pressure the quarterback. Delay of Game: occurs when the play clock has expired. Dime Back: football jargon for the sixth corner back on the field in a dime defensive scheme. Dime Coverage/Package: implementation of a scheme used primarily to stop the pass where six cornerbacks are used. Double Coverage: two players on defense assigned to cover one offensive player. Down: one play, measured from the time the ball is put into play and lasting until the ball is ruled down. Down and In: a receiver route where a wide receiver will run down the field on a straight line and then cuts toward the middle of the field. Down and Out: a receiver route where a wide receiver will run down the field on a straight line and then cuts toward the sideline. Down the Field: football games glossary term for direction of opponent's goal line. Draft Choice: player selected by pro team from college players for the annual draft. Drive: a series of plays that end in a score or a turnover. Aren't those long drives exciting? Drop Back: football jargon for the action of a quarterback taking steps backwards behind the offensive line in order to throw the ball. Drop Kick: motion where the ball is dropped and kicked after it hits the ground. Eligible Receiver: a member of the offense that is eligible to catch the football. Encroachment: a penalty called when a defensive player touches an offensive player prior to the ball being hiked to the quarterback. End Line: football term for the boundary line located at each end of the field. End Zone: the area that must be reached to score a touchdown or two-point conversion. Extra Point: a field goal kick after a touchdown is worth one point, if successful. Football is best described as a BIG game, both on and off the field. American football is closely guarded by both players and fans as their game. We have tried to define that passion with this game glossary in 3 parts.